Here in the UK, we wear trousers, not pants. They’re cuffed to show off our trainers, not our sneakers. And when those shoes are no longer clean, we toss them in the bin, rather than the trash. But we’ll gladly welcome one US import, even though it refers to an item so British you could serve it with bacon and beans. 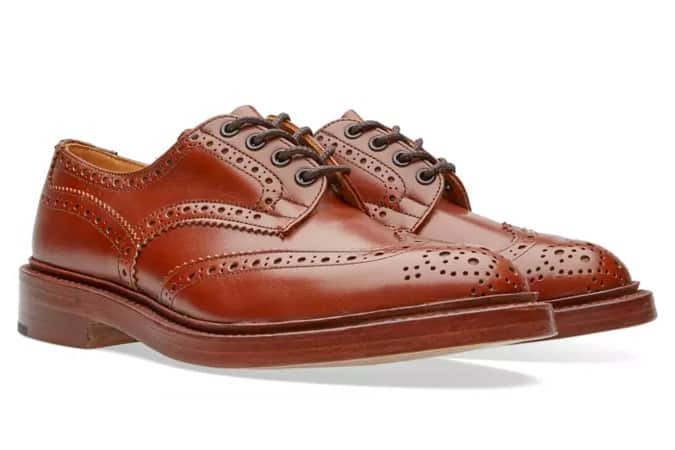 Across the Atlantic, our ‘full brogue’ becomes the ‘wingtip’. Both denote a shoe that, as our prosaic term doesn’t suggest, features a leather ‘W’ at the toe that echoes a bird seen mid-beat. A pair of wings, at the tips of your shoes. Wingtips. Thank you, land of Hemingway. We prefer ‘wingtip’ not just for its poetry. The term also offers some much-needed specificity. Men’s footwear styles are awash in interlocking and often contradictory definitions. Broguing, for example, properly refers only to the holes punched in the toes, though it is often used to mean any shoe with detailing. Equally, it’s possible to find wingtips without broguing – a smooth toe cap, but still with that swoop of leather toward the heel. They are known, confusingly, as austerity brogues. Actually wearing them is, thankfully, rather simpler. “Although they are a traditional style, wingtips must be the most versatile shoe ever,” says Andrew Loake, head of the eponymous Northampton shoemaker. 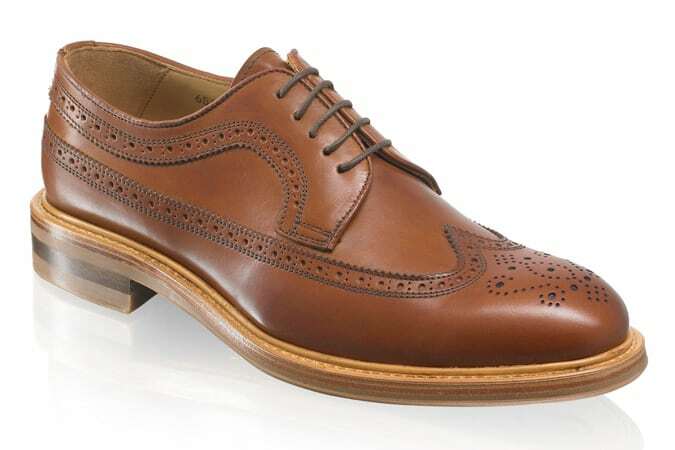 The wingtip was born from the brogue, which wasn’t always a shoe that one could wear to nice restaurants. “They were originally made from plaited hair and perforated, to allow water to pass in and out,” says Neil Kirkby, from Joseph Cheaney. That feature made life more pleasant for Irish farmers, who spent much of their day tramping through bogs and didn’t fancy taking the water with them. The name comes from the Gaelic word bróg, which means ‘shoe’, although ‘brogue’ didn’t enter the lexicon until the 1900s, to denote footwear you’d wear for a muddy ramble. At first, no decent sort would attempt brogues anywhere else. But, just as brown crept into town and hats slipped off heads, society gradually accepted that having some holes in your shoes wasn’t such a crime, so long as they were deliberate. The Duke of Windsor, who in the 1920s did more than anyone else to drag men into soft tailoring and clothes with personality, even wore his on the golf course, which helped speed up their acceptance. That movement from function to form, coupled with menswear’s general shift more casual, moved the wingtips from weekend to weekday too. “These days they’re obviously quite formal, although they were regarded as more casual than a straight toe cap,” says Little. “A bank manager, for example, wouldn’t wear them before the 1950s.” Nowadays, your bank manager’s probably swapped the suit for selvedge jeans and an unstructured blazer. But he’ll still be wearing wingtips. Modern wingtips are a world removed from bog waders. They’re now a wardrobe essential and, as befits any menswear staple, have been twisted into new and occasionally unrecognisable shapes. As with any leather shoes, black is smartest, then browns from light to dark, with colours the most casual. The same goes for detailing; less is more versatile whereas intricate broguing, or novel leathers, tend not to work for smart get-ups. As mentioned, these are wingtips with no broguing. Since they’re plain, they dress up a touch further, although they’ll still look just as good with jeans. Exactly the same as normal wingtips, but they continue above the ankle. As with any brogue boots, they’re more casual so work best with casual trousers or split suits. 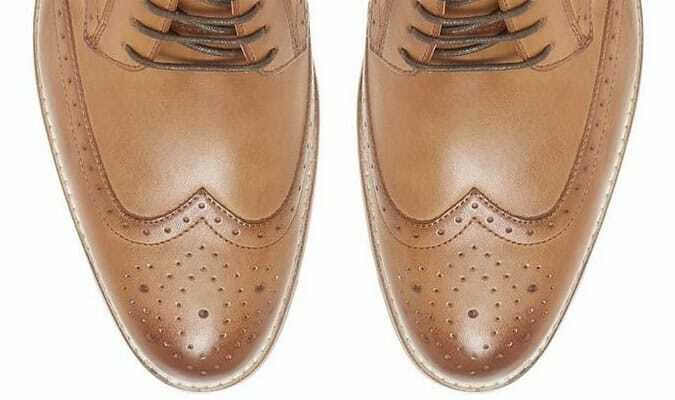 These are wingtips in contrasting colours – one shade of leather for the toe cap, another for the rest of the brogue. “Two-tone versions are taken from colonial references,” says Kirkby. They were big in the 1920s, although even then they were considered flamboyant. These days they tend to drag the eye from everything else you’re wearing, so should be worn with care. A pair of wingtips will work with almost anything, if you buy right. And don’t be shy about opening your wallet; it’s an area of your wardrobe where every pound pays back dividends. If you spend a bit extra you’ll be more comfortable, more stylish and your shoes could last more than a decade. These are the key things to look out for. “They should have a Goodyear welting construction,” says Loake. “A traditional style should be made the traditional way.” It also makes your shoes hardier and means you can swap the soles out easily when they get worn, rather than tossing the entire shoe after a year. If they’re not leather, move on. There’s a reason it’s been the material of choice for centuries – it’s hard-wearing but breathable and ages beautifully over time. If you’re after something more casual, try suede, says Kirkby. Just check the forecast first. The curved leather is tougher to stitch that a straight toe, so inspect how neat the work is as a barometer of quality. “The balance of the style is critical,” says Kirkby. “Look for the correct spacing from the toe section to the lace section.” Beware styles that look cramped or overly airy. Like any leather shoes, wingtips pay back what you put in. Treat them well and you could even hand them down to your kids. “Wingtips will benefit from a regular application of quality wax polish,” says Loake. “This helps to moisturise the leather, keeping it supple and helping to prevent cracking.” Wipe them clean before smearing on polish and use a toothpick to pick the excess out of the broguing, to stop gunk building up. When it concerns quality, Northamptonshire shoe brands are considered some of the best in the world. Grenson has no doubt had a hand in this. Founded by William Green in 1866, Grenson – an abbreviation of William Green and Sons – became known as such in 1913, and has peddled sterling wingtip shoes ever since. 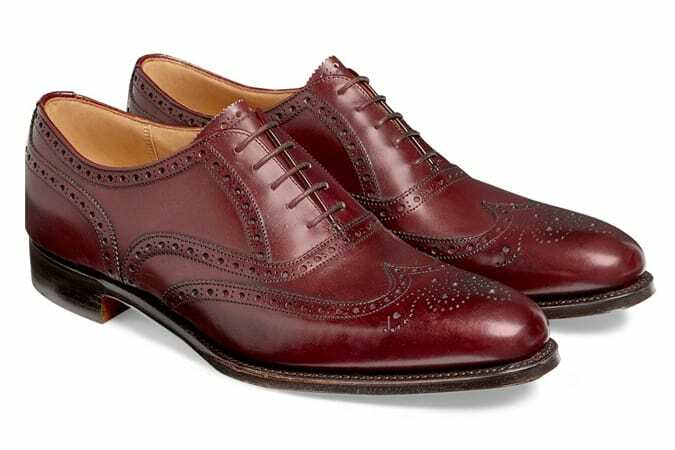 You wouldn’t necessarily consider Ted Baker as a go-to for wingtip kicks. But you should. Like all of its other wares, the British label does a grand job, with a range of shoes available in classic tones alongside left-field options in blue leather and suede. Simon and Garfunkel, Salt-N-Pepa, actual salt and pepper – all duos that pale in comparison to Russell & Bromley. Still run as a family venture, the British footwear label began in 1873 as the marriage between two shoemaking clans, and the wingtip shoe collection is testament to the brand’s expertise. Thom Browne: dizzyingly expensive, and dazzlingly, well, dazzling. The New York City-based designer debuted his first collection in 2003, and from there, branched out into menswear and footwear too. Sure, you’ll be paying through the nose for a pair of his wingtip shoes, but Thom Browne is the ultimate in luxury stateside clobber. It may be part-owned by Prada these days, but Church’s is a British brand through and through. In 1873, the eponymous Thomas Church and his three sons founded the label in Northamptonshire (that place again), and helped establish the local technical college. Today, you can expect a range of wingtip shoes in classic leathers that’ll serve every smarter look imaginable. As another jewel in the Northamptonshire crown, Barker has been trading for over 135 years and is responsible for producing 200,000 pairs of kicks on an annual basis. You only need one, though, so settle for a pair of brown or black wingtip shoes to anchor your 9 to 5 suit. With over 130 years of experience in the shoemaking business, Loake has crafted wingtip shoes in the same family-run factory since 1894. That’s a lot of footwear. That expertise means you can expect nothing less than classic British craftsmanship from one of the country’s most storied labels. Throughout the first world war, Cheaney produced around 2,500 pairs of boots for our boys every single week. No mean feat. These days, it’s more focused on the everyman than the infantryman, but the same level of military precision is evident in the brand’s line of wingtip shoes, brogues, boots and loafers. For over 20 years, Oliver Sweeney wingtip shoes have been crafted in the same family-run factory in Marche, a region on the Adriatic Coast of Italy. From there, a multitude of traditional kicks in a range of suedes and leathers are shipped to British shores to complement Oliver Sweeney’s mainline of clothing and accessories. Italians do it better after all. There are dozens of wingtip options at this youthful British shoe shop. Combining fast fashion and high-street prices, you can choose between a dizzying number of colours, leather finishes and sole options. Whether you want to look traditional at the office or fashion-forward at leaving time, you’ll find something here and probably have change from £100. Dune exploded from a small concession on London’s Oxford Street in 1992 to a global brand with hundreds of stores and a presence in 10 countries. Its reputation for affordable pricing and huge choice is borne out in a quality selection of wingtips that include classic work shoes, boots and less sober options with fashion-forward touches like contrast laces. Sort of the cobbler version of your most trusted uncle, the guy you can go to with any problem and come away with a sensible solution, Clarks has been putting men on a sound footing for generations. Look here for classic, chunky stompers and more modern touches such as contrast-colour or cushioned soles. From its founding in 1879, this family-run Northampton firm has been making quality footwear good enough for the feet of Antarctic explorers and James Bond (in Spectre) alike. Expect the finest quality leathers and Goodyear welting that’s second to none. Choose between a textured scotch grain finish or smooth calf leather. The internet’s one-stop shop for all things menswear does – surprise, surprise – a good line in affordable wingtips. From own-brand brogues that cost less than a night out, through steady mid-level shoes from the likes of Kurt Geiger through to Goodyear-welted stompers from firm favourites such as Grenson, there’s a shoe here for every foot. Makers of some of England’s best boots and shoes since 1829, Tricker’s calling cards are exceptional quality leather and a hand-made process than ensures your wingtips last longer than anything else in your wardrobe.